In search of an early Happy Hour meeting with a colleague found us at House Wine on a Friday afternoon at 4:00pm. Marc and I have visited this quaint wine bar a couple of times in the past, both times impressed with the wine by the glass offerings. Yesterday was no different. I asked for a glass of red, commenting that I have really been enjoying Italian wines of late. 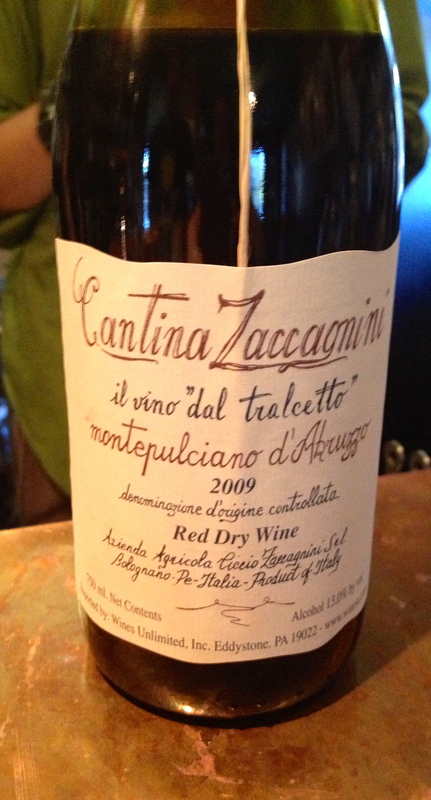 The wine steward without hesitation recommended a popular Montepulciano from the Abruzzo Region in Italy. The wine list description accurately describes this lovely wine – “bright berries, herbs, juicy cherries, with a hint of vanilla”. The weather was warm for this time of the year, so we enjoyed our wine out on the deck, with a small cheese platter. A perfect way to celebrate the end of a busy and memorable week of music making! – Bookending a wonderful concert of choral music from the Renaissance Period performed by the SU Chorale. We ate there twice this past Saturday night – Dinner before a choir concert at Southwestern University; Dessert afterwards with our son – who would never forgive us if we did not offer to take him to the Monument while we were in town. I definitely have my “go to” meal at Monument, one of those rare occasions when I make the decision to eat a little “healthier”, but don’t sacrifice flavor and pleasure in my dining experience. First, fresh biscuits. Did I say “healthy”? OK, this is a little splurge. You only need one, hot and fluffy with just a touch of butter. Oops! I forgot to take a picture before we dived in. Even the crumbs look tasty. 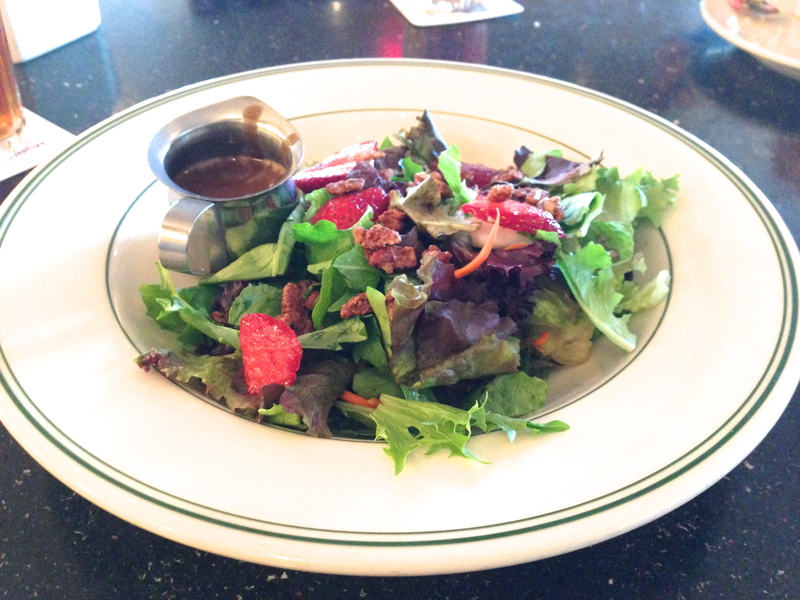 Next, the Dinner Salad (mixed greens, strawberries and candied pecans). Try the maple vinaigrette. 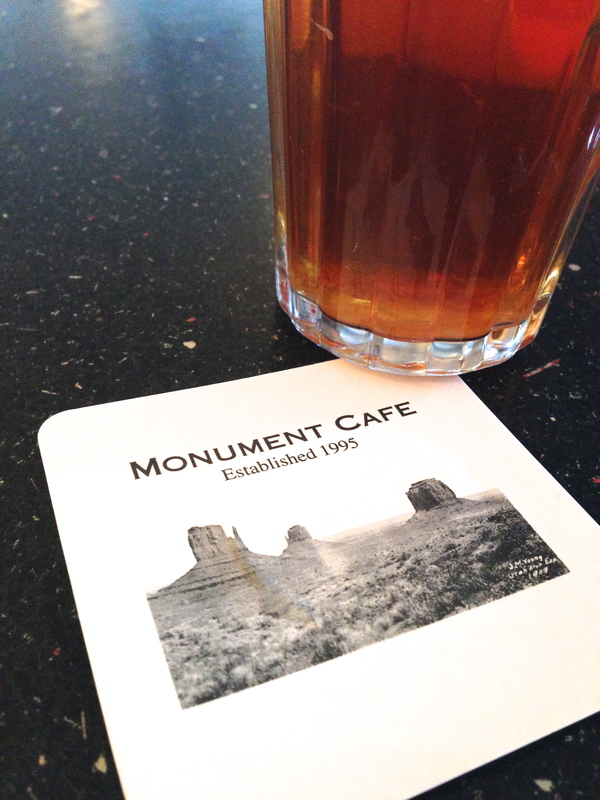 At many places this salad would be delicious enough for dessert, but not at Monument Café. Save room for dessert. It is always difficult to choose a dessert at Monument. 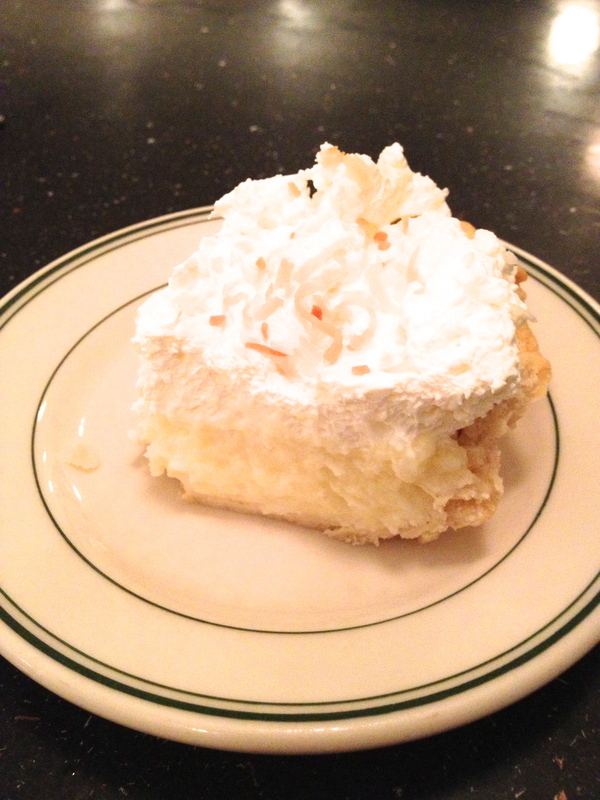 The two “regular” features are divine – the Monument Chocolate Pie and the Coconut Cream Pie. They also feature a Fried Pie of the Day (I’ve been known to sneak one of these home to enjoy with my late night cup of tea). The Daily Specials are always tempting as well. My son chose the Texas Chocolate Sheet Cake (served with vanilla ice cream). So which one did I choose this time? Can you say Coconut Cream Pie? If you look at the photo you can tell that I took my first bite before I remembered to snap a photo. This is where my vocabulary fails me. “Yum” comes to mind. “Yummy to my tummy”. My mouth is watering just thinking about it. It is one of those rare desserts that perfectly satisfies you (especially when the weather is warmer like it has been the past week here in Austin), yet doesn’t make you feel like you are carrying a “food baby” (I learned that term from my boys. It is a cute term for felling “stuffed.”). What dessert makes your mouth water? Where will you find us on Wednesday for dinner? At ZUZU on North Mopac. This spot is a no-brainer for our family – everyone likes the food AND they always have ESPN on the TV (not so exciting now that baseball season is over). We often run into folks we know and of course, our Hill Dillo friends. We all have our favorites, starting with the FREE Queso on Wednesday nights. Our youngest is a chicken quesadilla fan. Our oldest likes to try different things, including the flautas and burritos. Marc has taken to the taco salad. 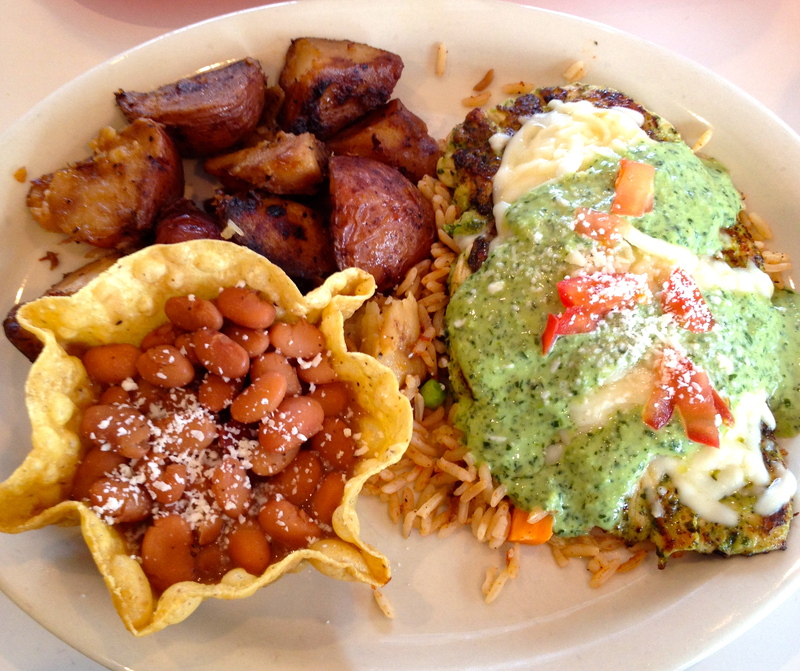 My favorite is the Cilantro Chile Chicken plate with Charro beans and Roasted potatoes. They also have a beautiful salsa bar, stocked with all kinds of garnishes to add to your plate. 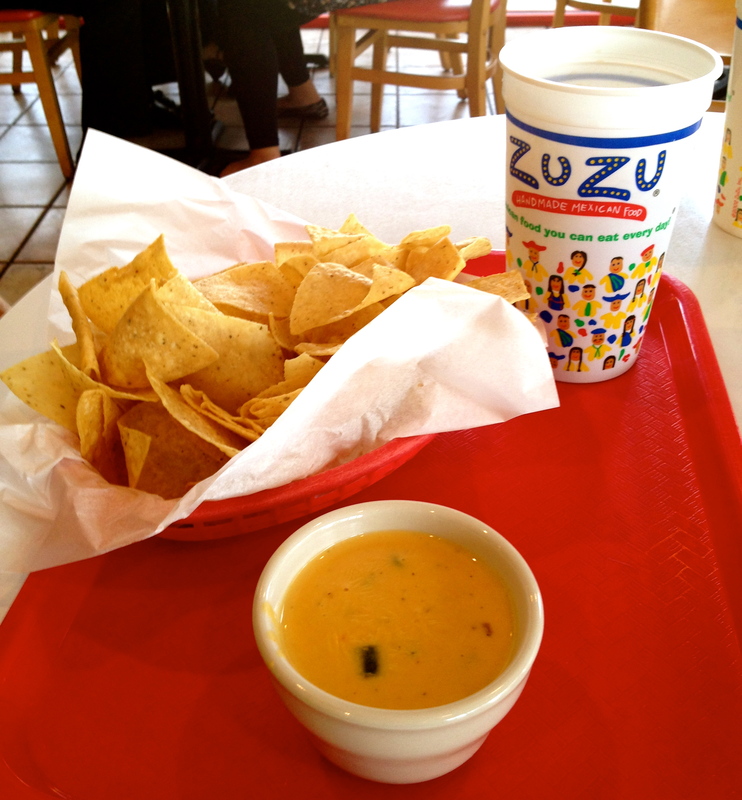 Have you eaten at Zuzu? If so, what is your favorite dish? Here is a peek at a few of our most recent culinary adventures. Yes… it’s a list…with links!! This was an easy and satisfying meal, and a good way to get in some of our Farmhouse Delivery produce. 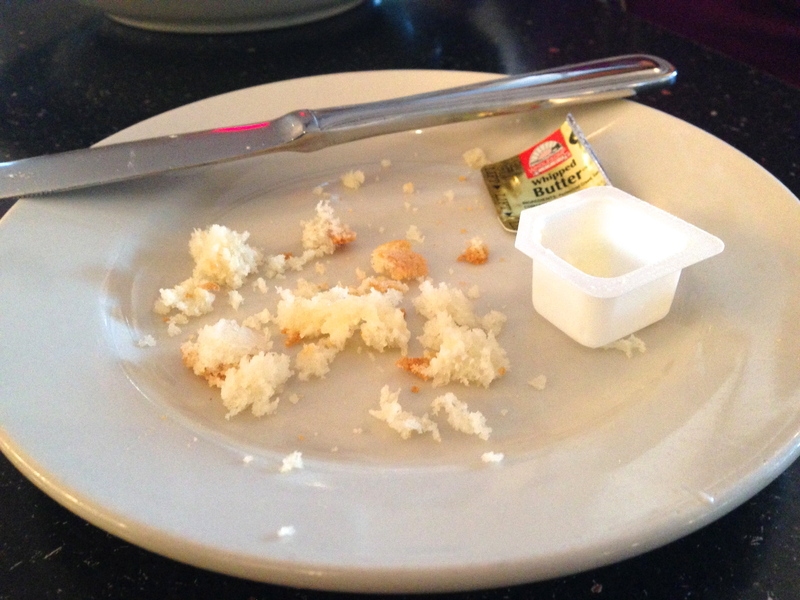 We especially enjoyed the honey mustard dressing. I happen to love coconut, but don’t shy away if you are not a fan – it adds more texture than flavor. A true winner! Any time I can get my hands on a boneless chuck roast on sale, I will head straight for this recipe. The work comes in trimming and cubing the roast – I cut mine a little smaller in hopes that it would cook a little faster. We liked it better than our traditional pot roast. Although I LOVE my potatoes, they were not missed here. 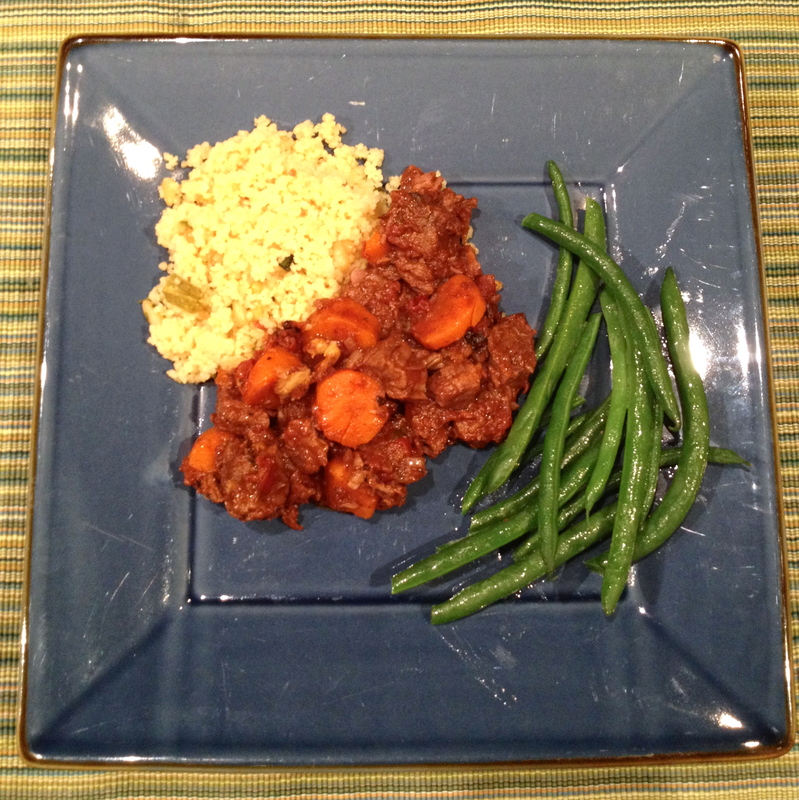 We also opted to go with whole grain couscous instead of egg noodles. Fresh FarmHouse green beans rounded out the plate. 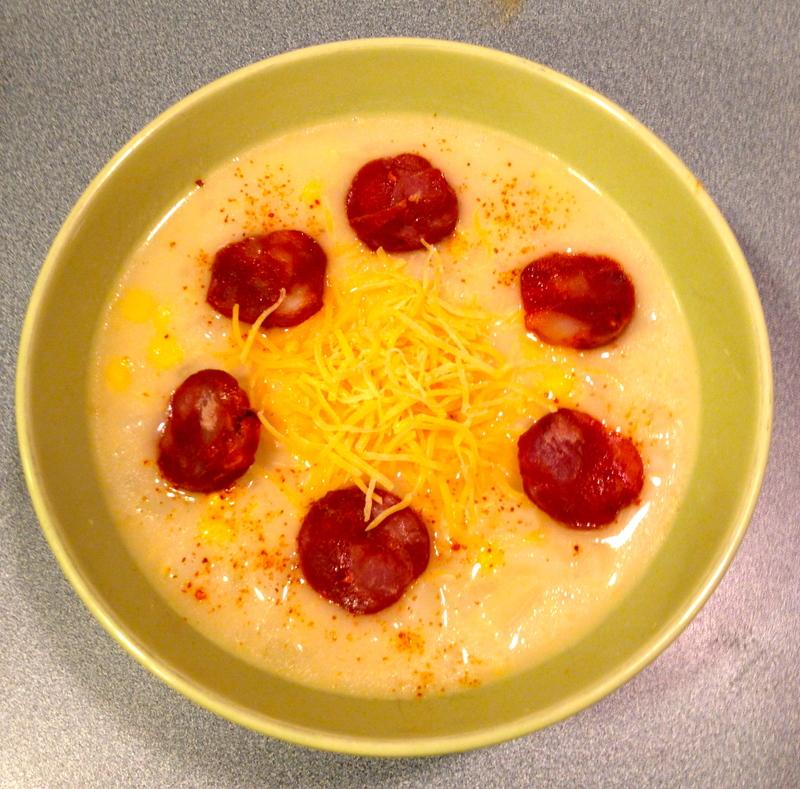 I was so tickled when my youngest son specifically requested this soup when the weather turned a little cooler last week. Another simple recipe – I definitely recommend using Gold / Yellow potatoes. They seem to have a creamier texture that comes through nicely in this dish. A dash of cayenne also provides a nice “kick” – be careful not to add too much. My older son needed a little something “more”, so I scavenged some leftover chorizo from the fridge and sliced it on top – delicious!